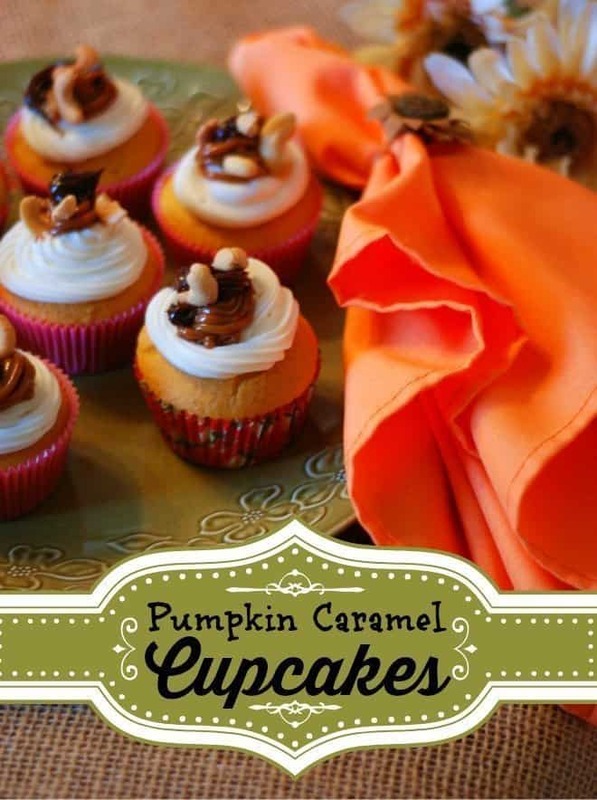 I’m celebrating Throwback Thursday with these Pumpkin Caramel Cupcakes! It’s never too early for pumpkin, right? These pumpkin caramel cupcakes have been staring at me since November 1st, when I turned the page of my Betty Crocker calendar. They had me at first glance. And every time I looked at the calendar, I would gaze longingly at the most perfect looking cupcake. 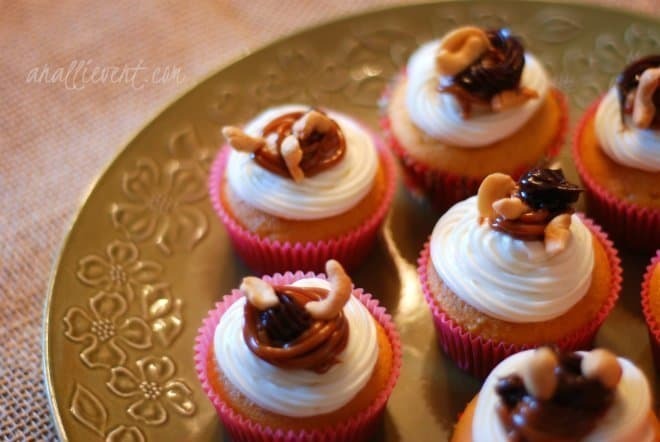 These spiced pumpkin cupcakes are lightly filled with dulce de leche and topped with cream cheese frosting, chocolate sauce and cashews. I told my daughter not to mention the word “pumpkin” in front of the grands unless they specifically asked (I cannot tell a lie) because I thought that “P” word would scare them off. Of course, their first question was, “What kind of cupcakes are these?” I said “dulce de leche” at the same time the daughter said “pumpkin.” So much for discretion. After Logan’s third cupcake (don’t tell his mom) he declared them to be delicious. All of my daughters and the hubby agreed that it was the best pumpkin cupcake ever. My picky son-in-law wouldn’t even taste them. He just ate some dulce de leche straight up. As for me, I’m dieting. I didn’t eat one. And the leftovers are going to work with my daughter and home with the grands. These are definitely a keeper and you can find the recipe here! Thanks, Betty! Helpful Hint: I’m usually a cake mix snob. I prefer my cakes made from scratch. But when I do cave and use a boxed mix, I always add a teaspoon of pure vanilla (I’m an imitation vanilla snob, too) extract. It just makes it taste more like homemade. Those looks absolutely scrumptious! I’m sure your grandchildren loved them. Nothing better than cooking for the grands! So true! Grands are really . . . grand! Have a blessed Thanksgiving! Oh my! Pumpkin and Caramel. These sound absolutely wonderful. Thanks you! Those look beautiful!!! My menu is already set for Thursday, but I might try these for Christmas time! Kristen Campbell recently posted…Cyber Monday and More! Hi Alli! 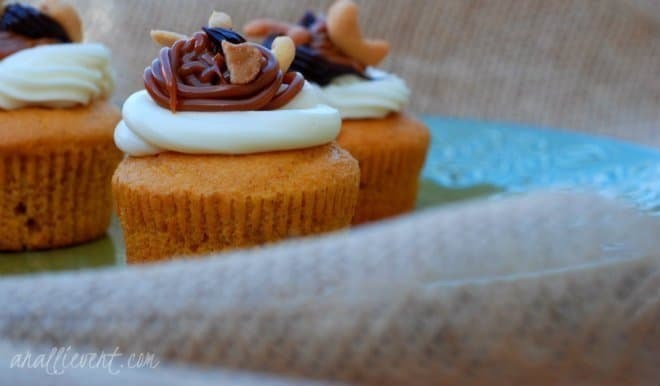 These cupcakes do look perfect and the flavor combination sounds just fabulous! Thanks for sharing and pinning! Hope you have a great week and just so I don’t forget, hope you and your family have a happy and blessed Thanksgiving! Hope you and yours have a beautiful, blessed and bountiful Thanksgiving! These are the cutest, yummiest cupcakes I’ve ever seen. And (especially this time of year) I’m obsessed with caramel. These are great. Thanks for sharing! 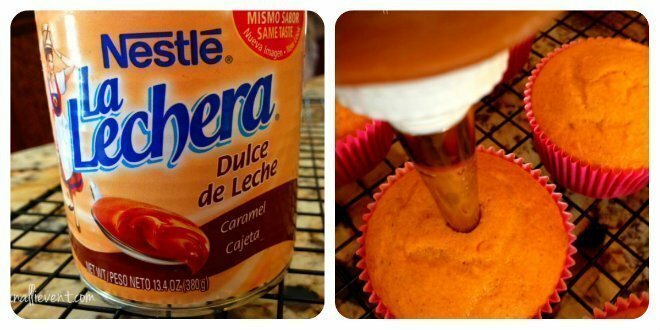 Dulche de Leche filled cupcakes? I’ll take a dozen! These looks simply fabulous. Thanks for sharing at Simple Supper Tuesday and have a blessed Thanksgiving. These look so delicious! I love pumpkins! They are such a fall staple! I love pumpkin everything! My favorite pumpkin spice creamer just appeared in the stores and I’m in pumpkin heaven! I love everything pumpkin… lattes, bread, cupcakes and pie. I am putting these cupcakes on my “to do” list. These are definitely the perfect fall treats…I love how you did the filling. Not to hard but definitely yummy! They are a family favorite and a must do for fall. I am so excited for fall! We love all pumpkin foods in our house so I can’t wait to make these. ….now if only the weather will cooperate! We had cool weather for a couple of days, but today was hot, hot, hot! These look so so good! I definitely wat to try these out one of these days! My family loved them, Logan! When I featured this throwback recipe today, they immediately asked me to bake some. Me, too, Heather! Pumpkin is always in season in my book. Thanks, Brenda! They are really good! Your posts always tempt me!! These look so amazing! I think this will be perfect for a Fall dinner or something special! These look so so so good. I agree about the box cake mix, I’m usually a snob too. But in a pinch, adding vanilla ( good vanilla) always does the trick! Glad I’m not the only cake mix snob! And, yes, really good vanilla can’t be beat! Honestly, Alli, these are just gorgeous! It hurts me sometimes when I cannot eat something like this right away!! LOL. I am pinning and thanking!